Pain, mystery, love, desire, and celebration played on more than a hundred instruments, from rainsticks to "talking drums" to Nigerian batas. Supreme Beats comprises an exhaustive collection of over five hours worth of inspiring acoustic percussion grooves and comprehensive instrument samples. Recorded over six months in top NY and LA studios, the production is state of the art. 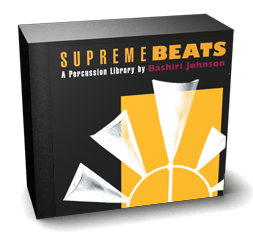 Widely acknowledged as the finest library of its kind, the Supreme Beats Percussion series is an essential resource for the modern composer, producer and remixer, that is destined to become a classic. Bashiri Johnson (Whitney Houston, Donald Fagen, Madonna), Luis Conte (World renown latin percussionist & LA session ace), Cyro Baptista (Brazilian master) and percussionists from Africa, South America, Latin America, and India. The key to Supreme Beats is that each percussion groove is presented in three tempos, first in a full mix, and then with each percussion element solo'ed, allowing for unprecedented flexibility in how the loops can be combined and applied to your music. Single hits of all of the instruments are included as well. In addition to the many traditional and ethnic percussion instruments used on Supreme Beats, unusual live sources such as elevator shafts, breathing, tap dancing, toy rabbits, chest pounding, vacuum cleaners, automobile parts, vocalizing, radiators and human stomping were creatively incorporated into the grooves, giving these rhythms a truly unique sonic quality. The additional vol. five CD "International" brings the magic of these grooves within the reach of every samplist. It contains 100% fresh, unreleased material from the original sessions, including Brazilian, Native American, Asian, Latin and more African grooves & samples. The CD-ROM versions developed by Spectrasonics include the complete collection of all the material from the five audio CDs plus more extensive hits and additional grooves, available for all major samplers. "... a feast of human feel, energy and emotion... enough material to feed an army of samplers... one of the most exhaustive and impressive percussion libraries we've seen, and it sounds even better than it looks! ... If we had three thumbs we'd turn 'em all up... Supreme Beats is a winner." "This is a knockout library. The performances and recordings are stellar."